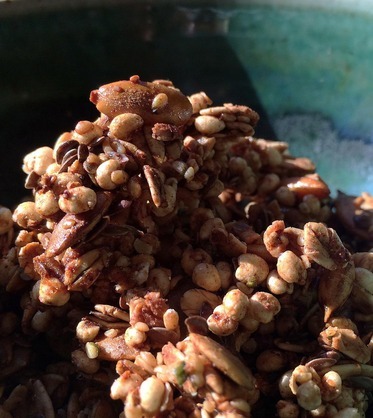 Homemade granola is a cinch to make. Highlighted here is a superfood blend of hemp seeds, raw pepitas and flax seeds with extra cinnamon pumpkin spice. Enjoy by the handful, over Greek yogurt or your favorite vegan version, add some crunch to your coconut ice cream or even over chopped bananas. It's a hit in our home with our toddler. Since some of the chunks are big depending on the size of your layering when you bake them, you might get some nugget sized ones perfect for little hands.